Reliable and reputable CCTV installations in Watford with extensive experience and expertise. Working closely with businesses across the region since 2005, 1st Choice Security Systems knows exactly what it takes to design and install CCTV systems that get the job done properly. Our dedicated team of security experts provides the most advanced CCTV installations in Watford for businesses, covering commercial and industrial premises of every shape and size. If looking to work with a team of CCTV installers in Watford who value your security as much as you do, reach out to a member of the 1st Choice Security Systems customer service team today. Unfortunate as it may be, it’s nonetheless true to say that certain areas of Watford have earned a less than ideal reputation over recent years. Nevertheless, the overall crime rate in Watford isn’t particularly higher or lower than in most comparable regions across the country. Crime tends to centre on the usual issues – burglary, antisocial behaviour, robbery, theft, shoplifting and so on. The prevalence of each varying significantly from one specific area to the next. The way we see it, mounting the strongest possible defence against every type of crime is really the only way of looking after your business interests. Which means that if you want to discourage criminals from targeting your business in the first place, you need to get serious when it comes to security. With the help of 1st Choice Security Systems, we can help make your commercial or business premises an entirely less appealing target for criminals at every level. Since the day we went into business, we’ve worked hard to build an unrivalled reputation by providing truly dynamic and flexible CCTV installations in Watford. We genuinely believe that as every business is fundamentally different, every business also needs its own unique security solution. Which is precisely why we design intelligent and innovative CCTV systems from scratch, in direct accordance with the requirements and budgets of our customers. Meaning that regardless of the size, location or nature of your business, we can provide you with the kind of total coverage you need. A reliable CCTV installation can be helpful when it comes to both the identification of perpetrators and the prevention of criminal activity in the first place. Whether looking to cover your business premises as discreetly as possible or make a statement with the most aggressive approach to CCTV coverage, we can make it happen. Simply get in touch with the 1st Choice Security Systems team to discuss your requirements and we will design and create your ideal CCTV installation accordingly. 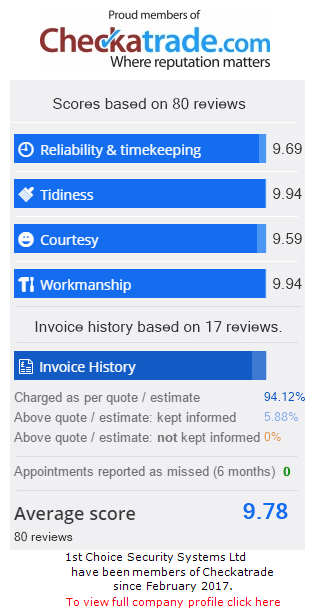 What’s more, as an independent company with the strongest small business values, you can rely on our advice and support as 100% honest and impartial at all times. We understand the importance of peace of mind and will do whatever it takes to exceed your expectations for the lowest possible price.